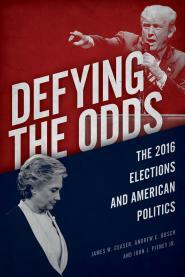 In Defying the Odds, we discuss how the issue of Supreme Court nominations affected the 2016 race. When Judge Brett M. Kavanaugh introduced himself to the American people on Monday, with a beaming President Trump beside him, he had a lot to say about his mother, a former high school teacher and a Maryland judge. He accorded his father strikingly less attention — just 34 words, compared with 132 about his mother — mentioning his “unparalleled work ethic” while not saying exactly what work he did. The women rushing to Kavanaugh’s defense include Candi Wolff, the top lobbyist for Citigroup; Sara Fagen, a consultant at DDC Public Affairs; and Laura Cox Kaplan, a former lobbyist for PricewaterhouseCoopers who now hosts the “She Said/She Said” podcast. Many of them belong to a class of connected Washingtonians who typically try to avoid upsetting their corporate clients by weighing in on Beltway scandals. But they decided to speak because of their friendships with Kavanaugh, who’s deeply integrated in the Republican social scene in Washington. Kaplan said in an interview that it was “physically painful” to watch the scandal unfold. It turns out that the Keystone Cops detective work by conservative legal activist Ed Whelan — which set Washington abuzz with the promise of exonerating Brett Kavanaugh, only to be met by mockery and then partially retracted — was not his handiwork alone. CRC Public Relations, the prominent Alexandria, Virginia-based P.R. firm, guided Whelan through his roller-coaster week of Twitter pronouncements that ended in embarrassment andv a potential setback for Kavanaugh’s hopes of landing on the high court, according to three sources familiar with their dealings. After suggesting on Twitter on Tuesday that he had obtained information that would exculpate Kavanaugh from the sexual assault allegation made by Christine Blasey Ford, Whelan worked over the next 48 hours with CRC and its president, Greg Mueller, to stoke the anticipation. A longtime friend of Kavanaugh’s, Whelan teased his reveal — even as he refused to discuss it with other colleagues and close friends, a half dozen of them said. At the same time, he told them he was absolutely confident the information he had obtained would exculpate the judge. The hype ping-ponged from Republicans on Capitol Hill to Kavanaugh’s team in the White House, evidence of an extraordinarily successful public relations campaign that ultimately backfired when Whelan’s theory — complete with architectural drawings and an alleged Kavanaugh doppelgänger — landed with a thud on Twitter Thursday evening. A press adviser helping lead the Senate Judiciary Committee’s response to a sexual assault allegation against Supreme Court nominee Brett Kavanaugh has stepped down amid evidence he was fired from a previous political job in part because of a sexual harassment allegation against him. Garrett Ventry, 29, who served as a communications aide to the committee chaired by Sen. Charles Grassley, R-Iowa, had been helping coordinate the majority party's messaging in the wake of Christine Blasey Ford’s claim that Kavanaugh sexually assaulted her 36 years ago at a high school party. In a response to NBC News, Ventry denied any past "allegations of misconduct." Sources familiar with the situation said Ventry was let go from Bell’s office after parts of his résumé were found to have been embellished, and because he faced an accusation of sexual harassment from a female employee of the North Carolina General Assembly's Republican staff. While doing work for the Judiciary Committee, Ventry was employed by CRC Public Relations, a prominent GOP firm helping to promote Kavanaugh’s nomination to the high court. A company spokesman told NBC News, "Garrett was on a leave of absence from the company and as of this morning we have accepted his resignation."